PRODUCT: 7/32 X 14 inch SDS-Plus® Carbide Drill Bit, Powers Brand. Price/Each. APPLICATIONS: The Powers S-4 Plus carbide hammer drill bits are designed for use in rotary hammers / hammer drills equipped with SDS (slotted drive shaft) type chucks. 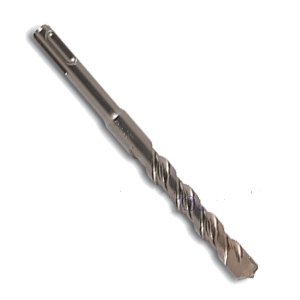 DESCRIPTION: The single tip bits are manufactured to conform with ANSI Standard B212.15 and can be used to drill in concrete, block, brick and soft stone. S-4 Plus SDS carbide drill bits are manufactured within a strict tolerance limits for the cutting diameter, the symmetry of the carbide tip to the drill axis, the symmetry of the tip point and the out-of-true variation. The optimal carbide and flute design provides up to 27% faster drilling and extended bit life. OPTIONS: Available to fit 5/32 inch up to 1 inch diameter and 4 to 24 inches in length.